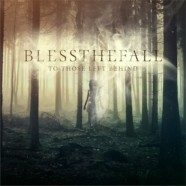 Four years ago, Blessthefall released Awakening. Leading up the the release, the band was receiving a lot of hype and buzz with most people saying the album could boost them to the top of the ranks and put them over to the next level. Did they deliver? Absolutely. Two years later in 2013 the band released Hollow Bodies, which saw them take a much heavier approach and kept the band rising to the top even more. This year they’re back with To Those Left Behind. You can attribute a lot of the buzz and success to the addition of Beau Bokan as frontman. The energy he brings to the table is infectious- not to downplay anything Craig Mabbitt did during his time, sometimes there’s just something that clicks and there’s no turning back. To Those Left Behind shows the band coming full circle and is by far their strongest offering yet. There’s the heavy style used on Hollow Bodies, the more melodic style of Awakening and more. The band really went all out on this one. As always, they have a strong message behind each song too. They’ve always had a strong message of positivity and unity and this album is no exception. Four albums into Bokan’s tenure, Blessthefall is proving album after album why they’re one of the top bands in metalcore and To Those Left Behind is just another piece of the puzzle that will one day form one of the strongest and most impressive legacies in all of metal.